The pinky baby quilt is done, and is covering my lap as I type. The rain is pouring outside, dark and grey. A quick rummage through my binding mini-drawer came up with some sweet bias check ready-made binding. I think I must have picked it up in a little shop in Trieste last summer, during a short trip for a conference. Pinky-pink, and a very simple construction of scraps and a piece of reclaimed creamy-white from a duvet cover. The (pinky!) back is from a duvet cover I had as a child, saved by my mother. How I love quilting memories and epochs together! 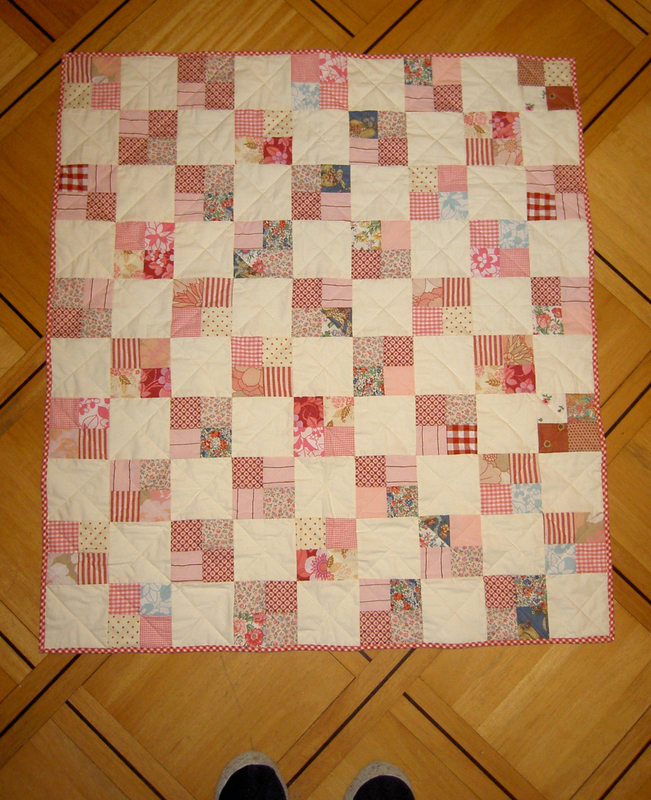 This quilt also contains the first blocks Miss R pieced by hand, such as the one on the top right corner. You can guess the scales from my blue fluffy slippers peeking out! So quite a small baby quilt, but perfect for small people to snuggle under on the sofa. If you want to learn to make this incredibly simple block, you can check out the Intro to patchwork tutorial I wrote for the short workshop I am running next weekend. The one-page tutorial is for hand piecing, with a short note on speed piecing by machine. (It’s a big file so takes some time to download. I must have set the photo resolution a bit high…) As the weather is totally frightful in Switzerland this weekend, it makes sense to just enjoy the great indoors! Happy sewing, and finishing Friday projects! Just visiting from CMQ. What a beautiful quilt. I love the colours and the diagonal quilting. You must be so happy with it.